The Edison Tech Center is proud to announce the publishing of our main video of this project: the Unit I video on ammeters and voltmeters. This nine minute video covers the history of meters from 1800 until today. 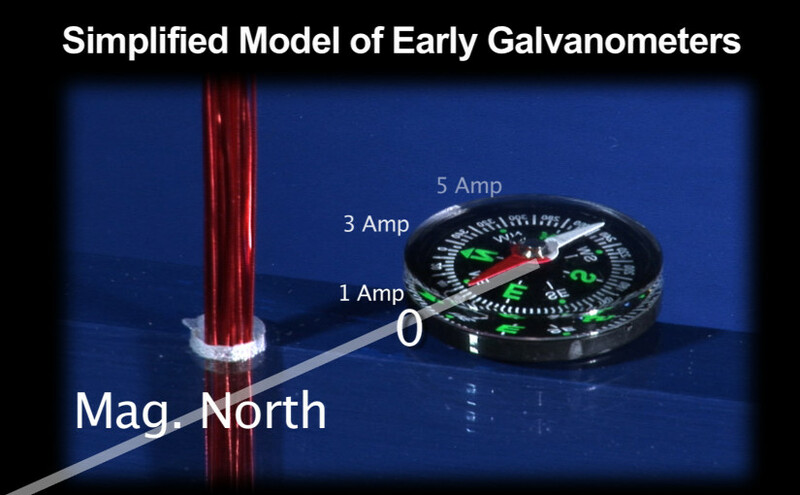 We talk about the need for meters, then the development of Galvanometers and later the moving coil galvanometer. We use simple demonstrations with compasses to illustrate how the meters work. This video is designed as the introduction to the subject of amp and voltmeters and is targeted at ages 13 and older. Our other outtakes videos go into a bit more detail on certain types of meters and their functions. When we interviewed what is perhaps General Electric’s greatest innovator of the 60s “Bob” Hall at the Edison Tech Center we had him tell us about his career and inventions. Bob Hall is known for developing the power rectifier, lasers and a practical lithium drift detector. Bob Hall’s most famous invention is the semiconductor laser which became the basis of hundreds of thousands of devices including the optical disk player (CDs and DVDs) and of course… the laser pointer! Our video How the Laser Works is an excerpt of the whole interview with Mr. Hall and is by far the most popular. Despite lasers being very popular and easy for the public to understand the importance of Mr. Hall’s personal opinion was that his hyperpure germanium detector (an instrument!) was the greatest invention. Why did he feel that this obscure detector which no regular person has heard of was the best addition to our technological history? Well, it’s because this detector allowed for the advancement of nuclear science and better understanding of our universe! Take a p/n junction and put a reverse bias on it, now you will get a space charge layer that will catch any ionized particles and give you a pulse of current. This detector will catch a gamma ray coming in (off a nuclear source for example) and create a pulse of current that will tell you the energy of the incoming gamma ray. Mr. Hall was first approached on a ski trip by a colleague at General Electric who complained that nuclear researchers were having a lot of trouble with germanium because the Eagle Picture germanium mine in Oklahoma had a change in processing that resulted in a world-wide crisis with those working with the element. Eric Pell at the GE Research lab initially discovered the lithium drift process. The nuclear physicists then figured out how to make massive lithium drift detectors (space charge layer 1cm thick). These large drift detectors were not stable at room temperature and had to be kept at liquid nitrogen temperatures. Bob began the task with the target of creating germanium with 1 part in 10 to the 13th of active impurities. This ultra pure germanium allowed detectors to be made more cheaply, smaller, more robust and stable at room temperature. This had an enormous impact on the development of nuclear physics. Today we use Bob’s intrinsic detectors in nuclear labs everywhere and even on satellites. While the website and videos are designed to be used together some viewers to prefer to only watch videos. We recently made this easier by creating the Universe of Instrumentation Series playlist on YouTube which includes all the videos from the series. Go to the playlist here. Our video component of this program reaches the most people, and stay tuned for more videos as we create more outtakes from our interviews with experts. Each unit in the Universe of Instrumentation program features a main video which covers the basics of sensors and instruments in a way which is easy to understand. Unfortunately one ten minute video just cannot communicate how awesome and diverse the field of instruments can be, so we have been publishing commentary from experts on various instruments in separate videos. here is a breakdown of some of the outtake videos we have published. Our first video is of Current Transformers featuring an interview we did in Western Colorado at Nucla power plant. The “CT” is important in instrumentation in that it allows us to use an ammeter on high tension powerlines. The CT has a transformer that scales the power down to a manageable amount (5 amps). 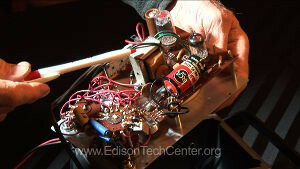 We had a lot of material on electric meters, so we had electrical engineer Bill Kornrumpf show us and talk about some rare vacuum tube multimeters from the archives of the Edison Tech Center. 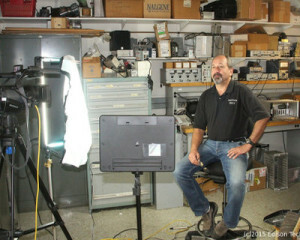 After this we had Bill do a second video interview featuring a simple 97 cent modern semi-conductor based multimeter. In the end of 2015 we interviewed electrical engineer John Lowe from the National Institute of Standards and Technology (NIST). We first had him talk to us about the problems with mechanical clocks in a short video. After this he talked a bit about Atomic Clocks. And finally we had him describe how they measure the phase difference between different oscillators using a Time Interval Counter. The time interval counter is an important instrument used at NIST. NIST in Boulder, Colorado is responsible for keeping US time synchronized by using the latest in atomic clocks. These clocks are necessary for keeping our GPS system running as well as other key functions such as economic markets. We talked to scientist Dr. Acton at Ball Aerospace to tell us about optics and telescopes. In this video here he tells us about the exciting new James Webb Space Telescope. 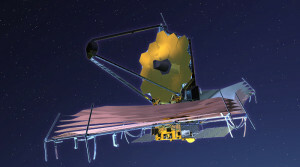 Part of the telescope is being constructed at Ball and several people working on the program are connected to or worked on the Hubble Space Telescope mirror. This is the cutting edge of optics! We had physicist Bob Lillquist from the General Electric Global Research center tell us about a subject he loves, historic audio technology. In the first video we had him talk to us about the first microphones from Alexander Graham Bell and Thomas Edison. This is all the videos we have put out so far, stay tuned for more outtakes and our primary Unit 1 video on ammeters and voltmeters coming out soon! The Edison Tech Center has recently launched a new blog for the Universe of Instrumentation Project and the Lighting Project. Expect pages to be under construction over the next few months as we update and move pages over from the main site.